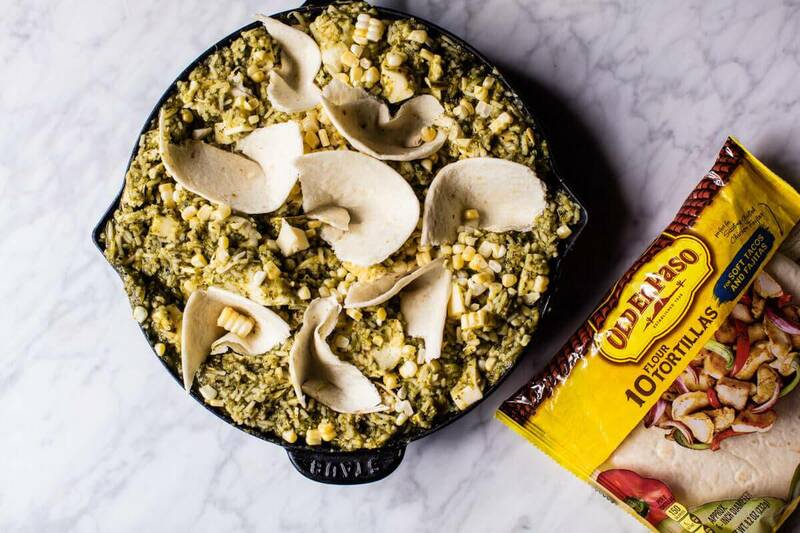 There’s really nothing better than a cozy tortilla bake. I’ve always loved making a tortilla bake over making enchiladas. I just find the rolling of enchiladas to be a little tedious for a busy weekday! One of my go to dishes for busy nights is rice + cheese + any leftover roasted veggies in the fridge. It’s something my dad used to do when we were kids and I have since followed in his footsteps. 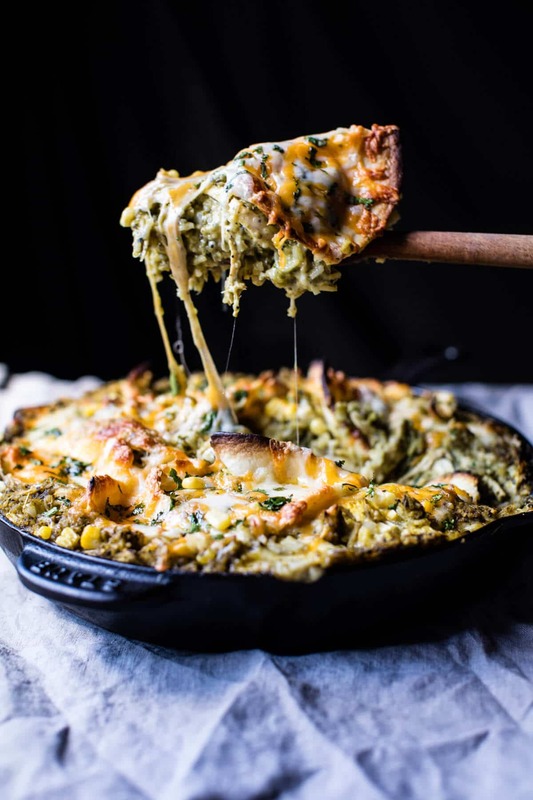 Today I elevated his rice bake, and twisted it into my own cheesy Mexican version, complete with homemade salsa verde, sweet corn, fresh Old El Paso tortillas, and of course, tons of cheese! The best part though? 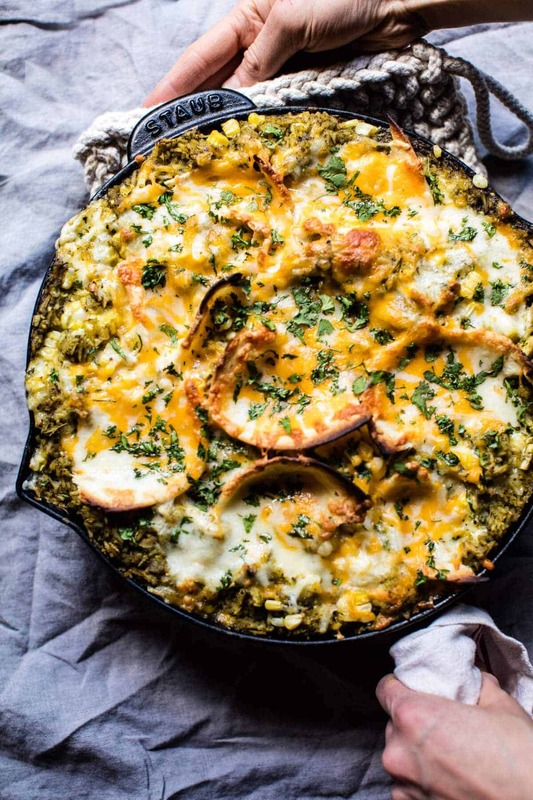 This dish is made entirely in ONE skillet! Yup, just one! Everything from the sauce, to the rice to the chicken! First up, the tomatillo sauce! 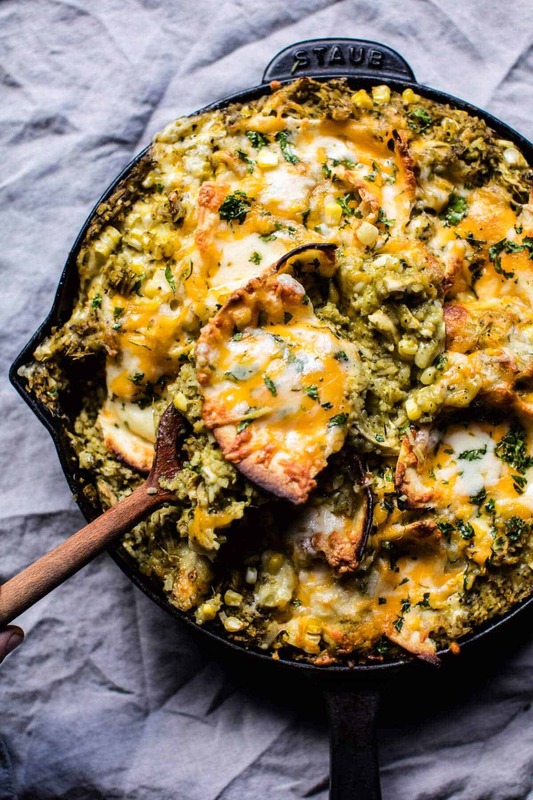 Char the tomatillos + poblano peppers + onions + garlic in a big ole’ skillet. Once charred remove everything from the skillet and puree into a sauce. Next, use the same skillet to cook the chicken + rice together with some chicken broth. Once the rice is fluffy and the chicken has fully cooked, it’s time to stir back in the salsa verde, and add some corn and flour tortillas. Then just top with cheese and bake! You see… all cooked in one skillet plus a little blender work. Simple as can be, and it’s such a delicious meal! 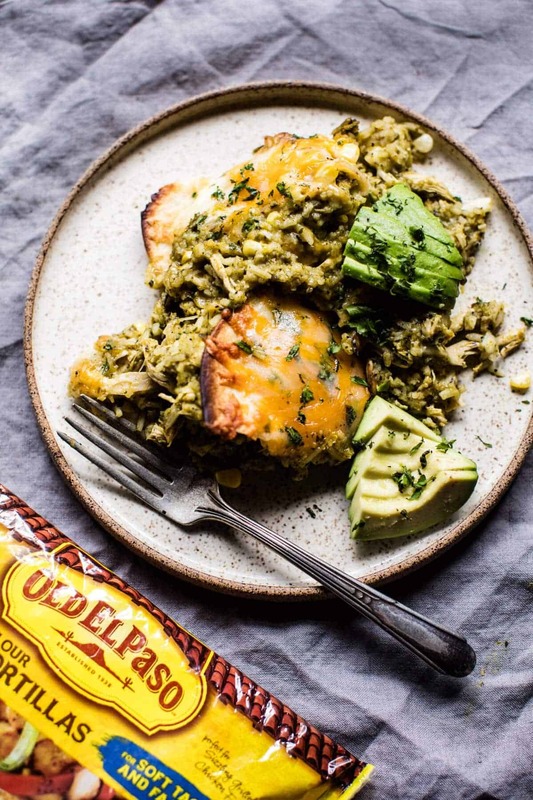 I mean, how could it not be…salsa verde chicken and rice + tortillas and cheese. Yes, please! Perfect dinner for a cozy Sunday night or a busy Monday night too! 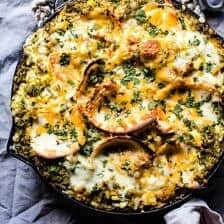 While I will not be making this Skillet Salsa Verde Chicken Tortilla Rice Bake tonight (cause um, we’re at Harry Potter World! ), you can bet I will be making this at least once in the coming week. I don’t know about you guys, but the fall always seems to be the busiest time of the year! When I get home on Tuesday it’s going to be GO mode through the weekend, as I have some big posts planned (hello to the holidays…Thanksgiving and Christmas I’m talking about you! ), video filming with the brother, a movie premiere to attend for my younger brother Red, and major work on that thing I call, the HBH cookbook! I am all things crazy excited, then slightly tired and anxious, thinking about that book… but mostly just really exited! How about you guys? What’s on the agenda for your week? Tortilla Bake should be number ONE. Just sayin’. Heat a large oven safe skillet over medium high heat. Add the onion, garlic and tomatillos and cook, turning often until charred on all sides, about 5 minutes. You may need to remove the garlic cloves before the onion and tomatillos. Once cooked, turn off the heat and remove everything from the skillet. When cool, remove the skins from the garlic. Return the skillet to medium high heat and add the poblano peppers and jalapeño. Cook, turning often until charred all over, about 5 minutes. Remove the peppers and jalapeño from the heat and place in a bowl, cover with a plate and allow the peppers to steam for 10 minutes. After 10 minutes, peel or scrape off the charred skins and remove seeds. Add the peppers to a blender, along with the onion, garlic and tomatillos, puree until smooth. Set aside this salsa verde. season with salt. Meanwhile, return the skillet to high heat and add the chicken broth. Bring to a boil and then add the chicken and rice, cover and reduce the heat too low. Simmer for 25 minutes or until the chicken is cooked through. Once the chicken is cooked, remove the skillet from the heat. Shred the chicken with two forks. Stir in the pureed salsa verde, 4 of the torn tortillas, corn, and cilantro. Top with the remaining 2 tortillas and then cover with cheese. Transfer to the oven and bake for 15-20 minutes or until the cheese has melted and is bubbly. 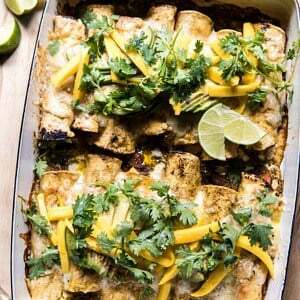 Serve with sliced avocado and fresh cilantro. 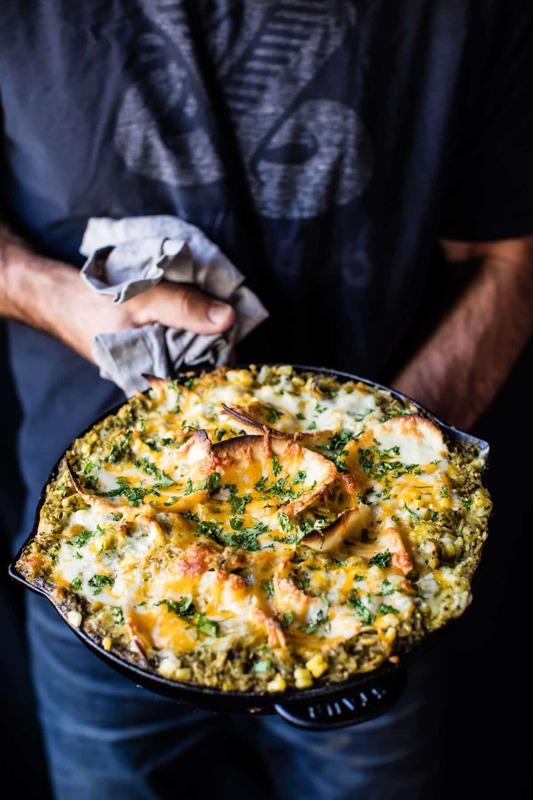 *To make this in a casserole dish, prepare as directed through the steps of adding the cheese. Transfer to a casserole dish and top with cheese. Bake as directed. *For a healthy swap, try using quinoa in place of the rice. 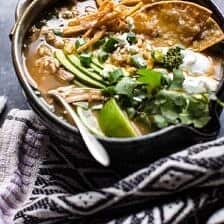 Salsa Verde Chicken and Rice Tortilla Soup + Video. Hope your Disney trip is everything you dreamed it would be. This recipe is being pinned until I get to the grocery store for ingredients. So awesome! I hope you love it, thanks Nancy! Happy First Sunday in October! I haven’t had breakfast yet and right now after seeing your bake, eggs seem a little anti-climactic! This is definitely on my to do list. YAY! I hope you love this one Marisa! Thank you! 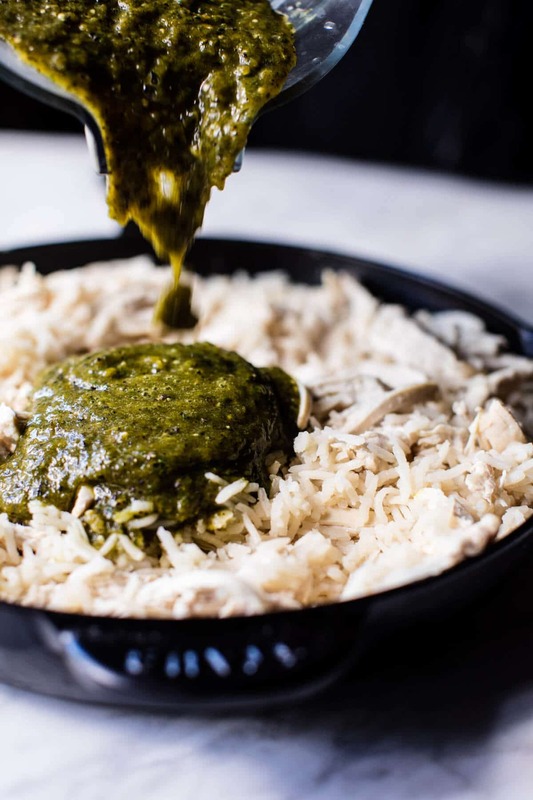 Such a comforting, hearty dish Tieghan! Can’t wait to try. Hope you’re having a blast in Florida! THis actually sounds very good!! Tomatillos are extremely hard to find in Holland. What could I use instead of them? Hi! I think tomatoes will work great. The sauce with be red in color, but it will still taste delish! Let me know if you have questions. Thank you! I love one pan/skillet meals when you don’t have a lot of dirty pans out! And this is no exception. There’s so much good stuff in this skillet meal. I Love it!!! And yes so comforting. Enjoy your Harry Potter adventure! ? Right?! It is so nice not to have to clean a bunch haha! Thanks so much Sheila! love this all in one cooking application! thank you for the inspiration, might have to add some jalapenos too! Ooo sounds delish! I hope you love it! Thanks Sabrina! Well it was perfect! Thanks so much Christine! Haha wow! Ya it is awesome! Thanks so much Alice! This looks amazing!! Awesome comfort food! Thank you Mick, so happy you are enjoying this recipe! Looks delicious as ever. One question. You mention in the ingredients olive oil but then don’t say where it is used in the instructions. Is it used somewhere? Thanks! Hey Natalie! Thank you so much for pointing that out! There is no olive oil needed in the recipe. Recipe is all fixed now. Let me know if you have other questions. Thank you! it looks unbelievably good! 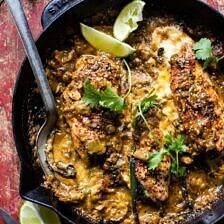 So creamy and another great idea for chicken. Sometimes it is hard to come up with something new when it comes to chicken. Perfect! Thank you for the recipe. Thank you Sarjan! I hope you enjoy this! sure thing sarjan, hope you got your chicken all worked out.. told you I would see you everywhere. made this last night for dinner, it was delicious and easy to do on a weeknight after work. Thanks for the great recipes!! Perfect! So happy you liked it, thank you Kristine! Made this tonight for dinner – so yummy! I substituted corn tortillas for the flour as that was what I had on hand. Will definitely be making this again. Thank you so much! Sounds amazing!! So happy you liked it! Thanks Lisa! So I was wondering, do you think brown rice would be good in this recipe? I am thinking this is a must make for this weekend! By the way… I just recently made the salsa verde chicken tortilla soup and loved it! Sounds delicious, trying it tonight. 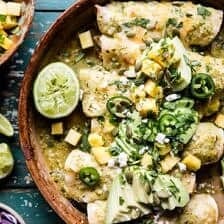 If I were to use prepared tomatillo salsa, do you know appx. how much your recipe yields? This was a hit with my bf and he is already asking for it again. TY! That is amazing! Thank you Ginger! I’m a bit unclear as to how we stack the tortillas in this? It’s not mentioned until the final two. I am so glad you enjoyed this Tammi! Thank you so much! This did not work, everything stuck to the skillet without any oil. Peppers did not char enough to be pealed, I had to do that under the broiler. Not enough moisture to blend the salsa verde, had to add stock. Cheese over cooked at stated time and temp. Was bland added cumin and taco seasoning. I also wish authors would not say salt and pepper to taste, give us a hint, if you actually made it. I am sorry this was clearly not for you. Is there anything I can help you with? Any questions you have specifically? Did you change anything about the recipe? We say salt and pepper to allow the cook to taste the dish and season it to their liking. Maybe I’m blind, but I don’t see when or how much salt/pepper to add. Please help!